I am not qualified to teach anyone about highway engineering, I have a trade-based background, and am only providing references to what you may find helpful in understand counting traffic and the limits of a car lane. The first information comes from a book you can find in Wellington City Library, called ‘Wellington, a sick city’ by W.B. Sutch, published in July 1966. Researchers for General Motors (hardly biased against motorways) found that “single lane traffic in various vehicular tunnels show this best speed to be about 20 miles per hour. At higher or lower speeds the volume drops”. In this test it was found that speeds as slow as 15 miles an hour enabled more traffic to pass than speeds of 60mph. The actual count: at 15 miles per hour, 1,176 vehicles passed a given point; at 35mph, the figure was 1,464; and at 60mph only 1,152. In other words a speed of 30 mph accommodated almost 30 percent more traffic than a speed of 60mph. Motorways for a city are as out of context as a dinosaur.
. What this helps us to understand is the difference between peak traffic flow and AADT (Annual Average Daily Traffic). – A busy inbound urban traffic lane within a signalised system carries between 650 – 850 passenger car units per hour. The third source also tries to explain the limits for a car lane works with different levels of traffic. This come from Presentation on concurrency for Polk County Florida. Note: road building is expensive. We have a piece of infrastructure capable of moving 1200 vph to 1400 vph per lane, but ideally not more than 760 vph. 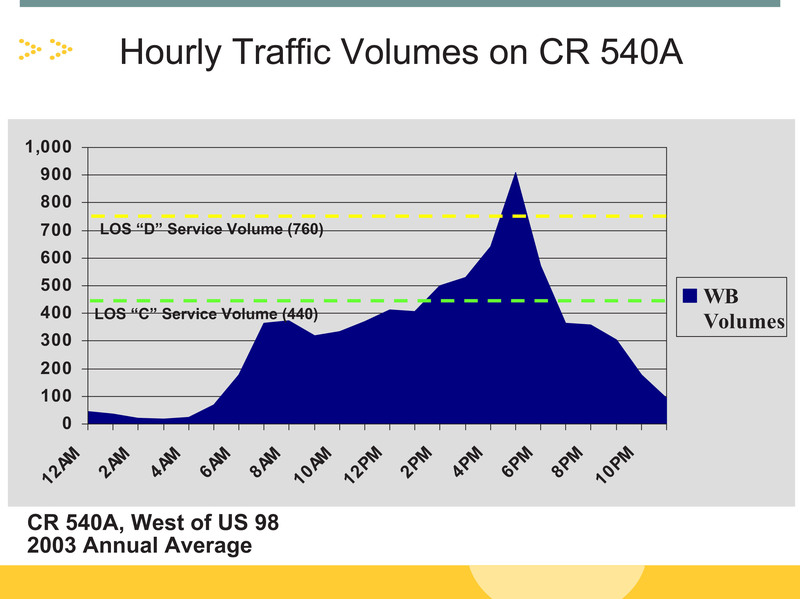 What the above graph shows is a road being under used for 95% of the day and over used for 5% of the day. If we are under using a road 95% of the day, we do not have a shortage of infrastructure; we have an issue with timing of flow and types of transport units. Here are a few more references documenting the “Greenshield Hypothesis”. Always helpful to have lots of references to similar facts, stated in different ways.